I've been slacking on these post, mostly because I like to have a picture to go with each post, but sometimes I just can't get one. Well, I can't be slacking anymore, so I'll continue posts even if I don't have any photos. I really hate the roads here in England. The highways (motorways) are ok, because they are just as big and straight as in the US, but the roads I'm referring to are all the other ones. In the picture above you can see a street right next to my house, and when all these cars are parked on one side of the road, it literally creates a one car only road. Yes, it can happen in the US too, but at least in the US there are large driveways which help avoid the situation. 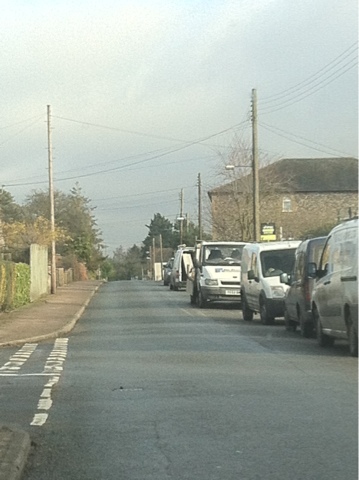 In UK, driveways are tiny, if there is even one, so everyone is forced to park on the side of the road. In addition, most of the roads where I live are extremely narrow and winding, to the point that I never know what's going to come around the corner. I think the main reason for that is because these roads were used to separate different farmer's fields, so they pretty much ended up following the shape of the fields. I could be completely wrong about that, but this is the only explanation I can come up considering I do live in the middle of nowhere with lots and lots of various fields. Driving at night is especially scary, because usually these roads have no street lights, so it's hard to see where you're going. Throw in some fog, extra bright lights, sharp corners and it's an accident waiting to happen. I will not miss driving on these roads, and will be so happy when we're back in the US.